Bones are awesome and it's really such a shame we don't seem them very often and by that, we mean we don't see them at all. (If you're a doctor or scientist then this differs for you. You lucky duck!) Sometimes we take a trip out to the warehouse and pluck a skeletal decoration from one of the bins to bring into the office just so we can marvel at a bare sternum and some ribs, maybe a patella or two. Is that weird? Perhaps, but there's no denying that human bones are pretty sweet. If you'd also like to see a bevy of bones on a daily basis then these skeleton leggings need to be yours. It's the most fashionable (and easiest) way gaze at a gorgeous pair of patellas. 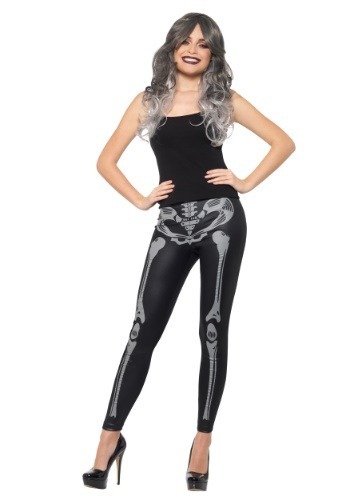 These stretchy women's skeleton leggings feature a comfortable elastic waist. Gray hip and leg bones are printed on the otherwise all-black leggings so your exterior perfectly matches your interior! These leggings can be worn with an outfit or used to coordinate your very own skeleton themed costume. They are also an ideal accessory for a grim reaper and sugar skull costume.